I purchase a goodly number of what many consider grimoire and boutique esoteric magic books in an attempt to stay current and keep my finger on the pulse of the occult market. Often times sad to say these boutique offerings are less than stellar in quality material than they are presentation. As my old boss Eric used to proclaim, “Regardless of how much you polish it, a turd is still just a turd” and this holds true for any number of these boutique offerings. However, on occasion, I run into a decent offering that actually fires on all eight cylinders and whose horsepower is up there with the big boys to use a euphemism from muscle car guys. Recently I have acquired just such an offering and I wish to share this with you as well as tell you WHY I love this grimoire and why you should not only purchase it but also use it in your practices. 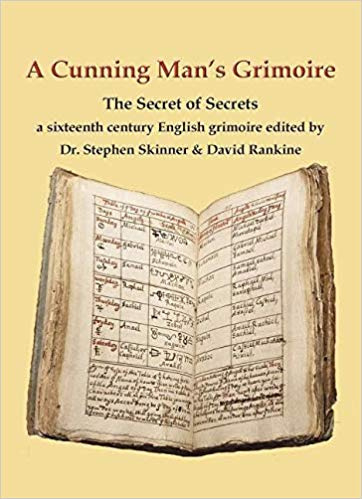 It’s called “The Cunning Man’s Grimoire: The Secret of Secrets” a Sixteenth Century English grimoire edited by Dr. Stephen Skinner & David Rankine. The first 33 pages gives you the history of this grimoire and how it not only came to be but also how it came to be in the possession of the practitioners and learned men from the day of its inception. I know many of you find history boring yet there are reasons to study history because you’ll often find clues as to how such books were used, when, where, by whom and in what instances which will give you as a modern practitioner much to contemplate and meditate on as well as help steer you into some of your own research. So before you go skipping the brief history lesson, trust me, it’s not that dry and boring. Not like other medieval & Renaissance grimoires tend to be. Read this one and enjoy it. Remember cunningmen were sorcerers who operated much like American Pow Wow and Hoodoo workers did. Most could read or at least read well enough to decipher the books and grimoires in their own collection though often they chose to utilize the grimoires and the talismans shown in those grimoires much differently than what the grimoires intended them to be used for. While this may at times infuriate by the book ceremonial magicKians, it does not take away from the fact these men were capable of great feats of sorcery on their own for their clients and customers as well as for themselves when needed. So this will be one major difference you will notice within the pages of this grimoire is that you are going to read some instructions that are going to call for you to use something differently than what a traditional grimoire practitioner does. I began my experiments using the prayers listed on pp 34-42. The prayers are to get you to become acquainted with the specific spirits (re: angels) of the various heavenly spheres (re: planets) listed. One of the things I did differently is that wherever I found a cross + in the prayer, typically used in the Catholic faith, I used Jean Kent’s advice from his “Master Book of Prayer” where he stated to recite the Qabalistic Cross then continue on with the prayer. This worked out very well because it revives a prayer with + listed in them regardless of how ancient they are. Thus every time I see the + symbol, I recite the Qabalistic Cross and then continue on with the prayer. The results are far better than merely reciting the prayer using the standard Catholic liturgy of the cross. Trust me on this one! I gave the prayers a daily workout of a full week to see what sort of experiences I could garner from them. I know, I know not much time in which to monitor the power of such a prayer thus it’s not that fair really. Still my results were better than normal and my luck seemed to be better than normal as well as I noticed my own Familiar spirits seemed to be more attentive which I believe is the goal of the prayers to begin with anyway. One thing I noticed about the B. Experiment given on p. 47 an experiment to summon your own good angel, i.e. your own personal spirit familiar assistant but NOT the same as a HGA) is that it says in the third paragraph down that “Then in a faire greene, pleasant & secret place”, I took this section of the sentence to mean you could find a spot outdoors that you find desirable, hidden and calming to your senses. This shouldn’t be a public place like a park but rather some spot in a wooded glen maybe or meadow that‘s away from prying eyes where you can hold a crystal and work with the spirits privately. The prayers and work continue for this working until p. 54 which seems quite a lot however there are stops in here where you are to call your angel and wait to see if He comes. If not, you’re to recite selected prayers again thrice then wait and return the following day and recite the prayers again while holding the crystal. This all seems much simpler than the method to obtain a spirit assistant in the PGM. Of course there’s the rite to call forth the angels Ancor, Anacor & Analos listed on pp. 55-58. Mostly this ritual involves much in the way of prayer like invocations which involve all three angels while sometimes using Goetia like spirits within the invocations. It’s a very interesting summonings and not one I have tried yet but I will as I would like to try and summon these three spirits into my black mirror. They seem from all accounts to be quite willing to come and be of service to the sorcerer thus I will be doing this and writing this experience(s) up on my website in the future. Pp. 75-92 we have a terrific section that is both well written and easy to understand section Astrological timing for the medieval & Renaissance sorcerer. This should give you enough of a background to work the grimoire properly and with solid effort your JuJu should come out on top form. Much is broken down into seasons, the 4 Elements, the 7 Planets, the 12 Zodiac, and so forth. It is always wise to know when to work your JuJu and when NOT to work it. Then beginning on p. 97, we have a nice section on fumigations which explains how to make the incense for your spiritual operations as it states, “First know that some fumigation[s] are to raise & cause spirits to appeare & some to dryve [drive] them away, or alay them, & binde them, for there is a great contrariety in power & vertue of fumigations on to another & in their effects even as is betweene the stars & spirits...” the instructions for fumigations ends on p. 110 however the instructions are very to the point, almost like a Hyatt Hoodoo manual is. This is a section that deserves much study by the practicing sorcerer for there are formulas in these pages which explain how to not only summon a spirit but also to bind It which can be useful to the right sorcerer in the correct situation. Beginning on p. 111, there are instructions on how to receive oracles. This is a chapter that Sorcerous diviners ought to study in-depth because here you’re given techniques on how to deepen your method of seeing that which you desire to see. True that much of these oracles rely on Zodiac times and tides however working within these parameters ought to heighten one’s useful abilities. There are instructions for receiving oracles in dreams as well as how to make a ring o Saturn or a ring of the Sun for an oracular tool. Then the manual begins to get a bit off key from traditional grimoires in that it suggests using the Kamea of Mercury, along with the planetary seal of Mercury, the seal of the Intelligence Tiriel for an oracular dream. The preparation of this talisman is made on a Wednesday, obviously, however you make it on silver (best) or write it in blue on parchment. You can also engrave it on tin but silver is preferred per the grimoire. On p. 124, there seems to be an image of a floor circle being used as a oracular talisman as well. Again this is where I spoke earlier about how some of this grimoire’s instructions are different than your typical grimoire tends to be. By the way a floor circle is a drawing of mystic designs put on the floor/ground by the practitioner then stood in while performing magic &/or summoning spirits. Here however it is drawn and used as a talisman for oracular dreams which is both interesting and parallels the way some folks in the USA have used such things for their purposes. Then beginning on p. 126, the operation of the Mansions of the Moon which is typically a far more involved type of image & astrological magic though here the instructions are fairly easy to understand and laid out well. These carry on for several pages and we come to a number of pages of Astrological tables then we finish off the text with numerous errata that I wish for you to discover on your own by purchasing the book because - it’s that good. This is a sorcerer’s manual, make no mistake about that, however it is not one of those flimsy, fly-by-night sort of manuals tossed together willy-nilly without thought or care. No this manual is meant to work in tandem with each successive page and it does seem to mesh well with one another. I know many seem to have an aversion to this manual because of it’s heavy Xian overtones but really? Think of the prayers as little more than mystical prayers designed to remove the dross of life from your being. Just pray them sincerely and if you’re not interested in Yahweh being the recipient of that power, will it to go your own ancestors. Yeah it’s that simple. This isn’t rocket science folks, it’s sorcery. Right? There are many other experiments I failed to mention such as Birto and other spirits but mainly because these Non-Physical Entities have already been covered in other grimoires already so pick this grimoire up, add it to your repertoire and most of all, USE IT! To hell with Cyprian and others, THIS is a real sorcerer’s grimoire and it works. I know because I’ve used it and I’m going to use it further. Especially in acquiring the angel assistant. That alone ought to generate tons of interest in this manual of sorcery. I give it 5 out of 5 stars because it is well done, researched, and the info is spot on. Further it comes from a book of information that actually works. The prayers themselves work and my own Familia spirits loved them! Imagine what they could do for you.